Roll on Dresden's new Kickscooters. Coming Soon: A City Tour on Kickscooters! Please book Kickscooters in advance. Our guided tours are only examples. We will gladly put together an individual tour to meet your needs. This bike tour begins at the Albertplatz in the Dresden Neustadt and follows the historic Königstraße to the statue of the Golden Rider. The route then crosses the Augustus Bridge, where you can enjoy a panoramic view over the Old City. We then cycle to the Theaterplatz with the Semper Opera, the Hofkirche, the Italian Village, Cafe Schinkelwache and the Semper Gallery. From there we commence a visit to the Dresden "Zwinger". Our way leads past the Tachenbergpalais to the Castle, where we visit the large and small castle gardens. By way of the Schlossplatz, we cycle past the Fürstenzug (Procession of Princes) and make a short break at the Stallhof. From there we continue to the Neumarkt with its Frauenkirche. We pass the Kurländer Palace and the Jewish Synagogue, cycling a short way along the Elbe River, over the Albert Bridge, back again to the Dresdener Neustadt. After a short stop at Pfunds Molkerei, our tour ends again at the Albertplatz. This bike tour begins at the Albertplatz in the Dresden Neustadt and follows the historic Königstraße to the statue of the Golden Rider. The route then crosses the Augustus Bridge, where you can enjoy panoramic view over the Old City, and then continues along the Elbe Cycle Path, past the Johannstädter Fährgarten, under the Waldschlößchen Bridge to the three Albrecht Palaces. We continue along the Elbe cycle path past the Blasewitz villa district, over the Loschwitz Bridge ("Blaues Wunder"), whereupon we make a short visit to the old village centre. After a short viewing of the Loschwitz Church, also constructed by George Bähr, who built the Frauenkirche, we return on the other bank of the Elbe to the Dresden Neustadt, where we make a short stop at Pfunds Molkerei, and then finally cycle through Dresden's trendy neighbourhoods to end at the Albertplatz. This bike tour begins at the Albertplatz in the Dresden Neustadt and follows the historic Königstraße to the statue of the Golden Rider. The route then crosses the Augustus Bridge, where you can enjoy a panoramic view over the Old City. We then cycle to the Theaterplatz with the Semper Opera, the Hofkirche, the Italian Village, Cafe Schinkelwache and the Semper Gallery. From there we commence a visit to the Dresden Zwinger. Our way leads past the Tachenbergpalais to the Castle, where we visit the large and small castle gardens. By way of the Schlossplatz, we cycle past the Fürstenzug (Procession of Princes) and make a short break at the Stallhof. From there we continue to the Neumarkt with its Frauenkirche. We pass the Kurländer Palace and the Jewish Synagogue, cycling along the Elbe to the three Albrecht Palaces. We continue along the Elbe cycle path past the Blasewitz villa district, the Blüherpark and the just as popular Striesen residential neighbourhood to the Großer Garten (Great Garden), the green lung of Dresden. Passing the German Hygiene Museum and the Stadium, we reach the VW Transparent Factory. From here we cycle back to the Albertplatz, where our tour ends. This bike tour begins at the Albertplatz in the Dresden Neustadt and follows the historic Königstraße to the statue of the Golden Rider. 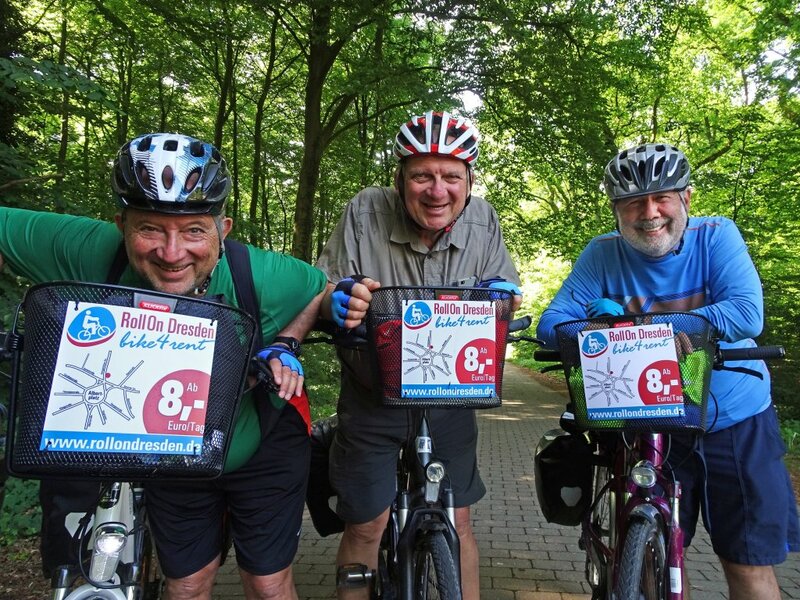 The route then crosses the Augustus Bridge, where you can enjoy panoramic view over the Old City, and then continues along the Elbe Cycle Path, past the Johannstädter Fährgarten, under the Waldschlößchen Bridge to the three Albrecht Palaces. We continue along the Elbe cycle path past the Blasewitz villa district, over the Loschwitz Bridge (also known as the "Blaue Wunder"). We continue along the Elbe through Laubegast, where many water sport clubs are based, to Kleinschachwitz. We then cross with a ferry to reach Pillnitz Castle. We make a round tour, exploring the castle park with the Riverside Palace and the Upper Palace, the Orangery and the New Palace, the English Pavilion, the Triton Gondola, and we stop too to admire the famous 230 year old Pillnitz flowering Camelia tree. After a short break we return via the Elbe Cycle Path to the Albertplatz. This bike tour begins at the Albertplatz in the Dresden Neustadt and follows the historic Königstraße to the statue of the Golden Rider. The route then continues along the Elbe cycle path, past the Japanese Palace to Pieschen, where we cross the newly constructed bicycle bridge and reach the lovingly restored Ballhaus Watzke, where we can enjoy panoramic views over the Elbe towards the Old City of Dresden. We continue our route, cycling through Altkaditz to reach Altkötzschenbroda, with its historic town centre, which has been laboriously restoredsince 1990 and empathetically completed with new constructions. Here, cosy cafes and restaurants in historic buildings tempt us to linger, and interesting shops and galleries are perfect for browsing. After our break we cycle on to Wackerbarth Castle, the Saxonian State Wine Estate. This baroque palace, surrounded by vineyards was commissioned by the former cabinet minister of August the Strong, General-field marshal and Imperial Count von Wackerbarth, as his retreat, complete with a "Belvedere" Summer House. With a view towards the Friedensburg, the Hohenhaus and Neufriedstein castle, we cycle along the foot of vineyard covered hills, along the Saxony "Weinstraße" to Hoflößnitz Castle. From here we can enjoy the view over the picturesque vineyards with the Spitzhaus Steps and the Bismarck Tower. We now pass the Meinholdsche Turmhaus and the Villa Sorgenfrei , reaching the Villa Old Shatterhand, in which Karl May lived until his death and where today the Karl May Museum is located. From here we start our cycle back to Dresden where our tour ends. This bike tour begins at the Albertplatz in the Dresden Neustadt and follows the historic Königstraße to the statue of the Golden Rider. 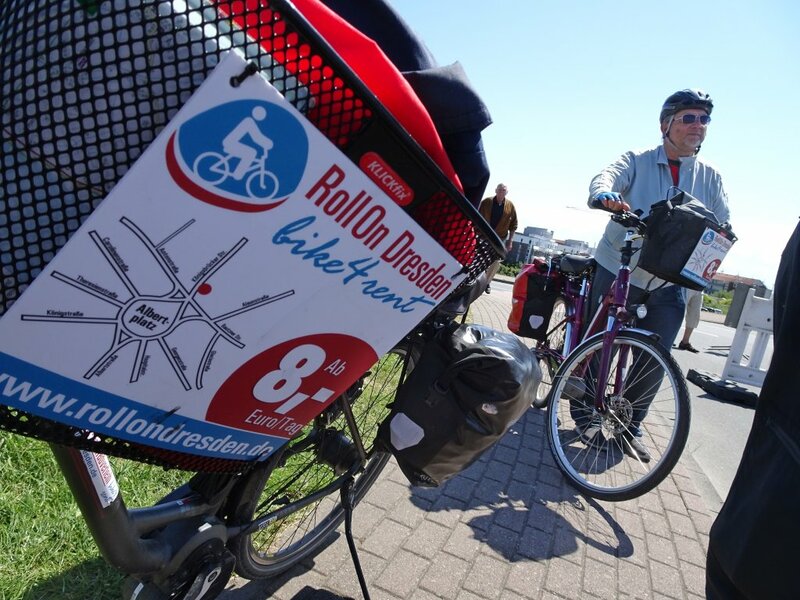 The route then continues along the Elbe cycle path, past the Japanese Palace to Pieschen, where we cross the newly constructed bicycle bridge and reach the lovingly restored Ballhaus Watzke, where we can enjoy a panoramic view over the Elbe towards the Old City of Dresden. 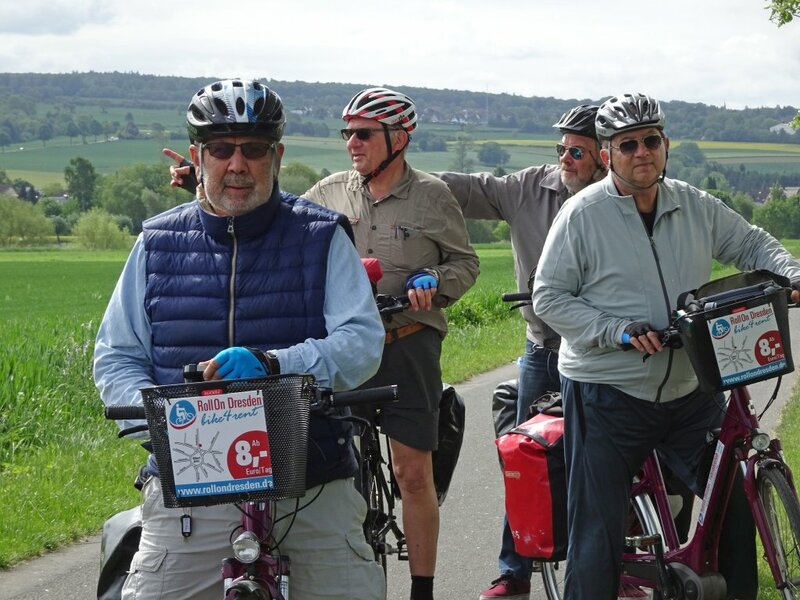 We continue our route, cycling through Altkaditz to reach Altkötzschenbroda, with its historic town centre, which has been laboriously resorted since 1990 and empathetically completed with new constructions. Here, cosy cafes and restaurants in historic buildings tempt us to linger, and interesting shops and galleries are perfect for browsing. We continue along the Elbe cycle path past Coswig, past the smallest mountain range in Saxony, the Spaar Mountains to Meißen. We take time now for a short wander through the historic old town of Meißen enjoy the enchanting view from the top of the Albrechtsburg over the Elbe valley. The Cathedral and/or the porcelain works can also be visited on an individual basis. Depending on the length of our visit, we can make the journey back by bicycle, or alternatively, reach Dresden using the S-Bahn. 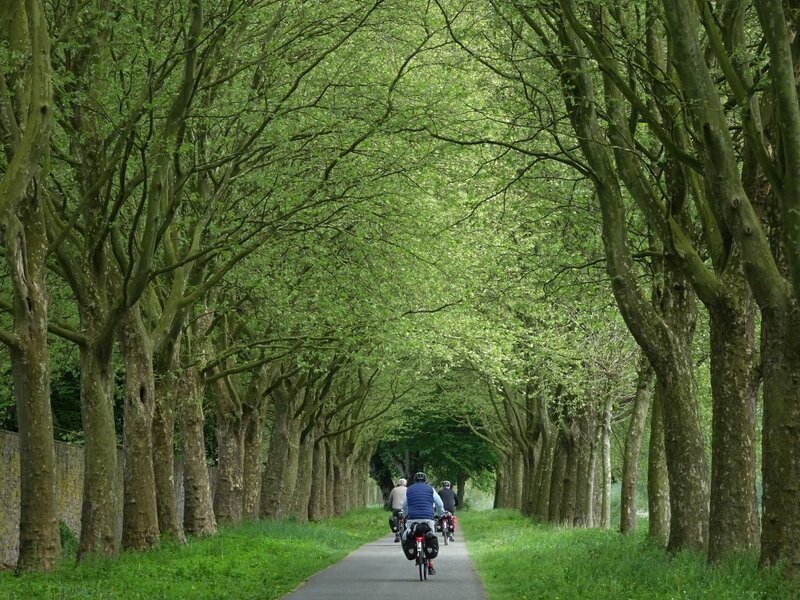 This bike tour begins at the Albertplatz in the Dresden Neustadt and leads us through the Dresden Heath, past Boxdorf into the Moritzburg Lake Region, which inspired the expressionist works of the artists of "Die Brücke" art movement after1900. In this cultural landscape we find the Moritzburg castle, outside the gates of Dresden, which was rebuilt by August the Strong for his own use. It is possible to tour the castle on an individual basis and see his hunting trophies, its precious leather wall coverings and last but not least the magnificent "Feather Room". Moritzburg Castle also provided the location for the fairy tale cult film "Drei Haselnüsse für Aschelbrödel". By request you can also visit the last abode of the artist Käthe Kollwitz. Our way now leads through the Friedewald Forrest to Fasanenschlößchen ("Little Pheasant Castle") and the miniature harbour with jetty and lighthouse on Lake Bärnsdorf. A tour of the Fasanenschlößchen on an individual basis is also possible with advance reservation.